Make sure to come out and see me and ArDuffle this weekend May 18 – 20 at the Motor City Comic Con, Suburban Showplace in Novi, Michigan. Note: I will be there on Saturday and Sunday, but will not be there on Friday. I will have copies of my book, SuperDuffle prints, original pencils used in various ArDuffle features, sketch cards and much more. I always look forward to an opportunity to meet my readers, and this is as good as it gets. While you’re there, don’t forget to get your picture taken with ArDuffle. He stands about three feet tall, and is ready for his photos op. This weekend I took part in a local Comic Con called the Flint Comix Con, put on by Flint Comix; a local comic paper with a distribution in the thousands. ArDuffle has been a regular feature in Flint Comix for over a year now, and the owners have invited me to the Comix Con for the past couple years. It is a great opportunity to meet local readers and other great artists involved with Flint Comix, so of course I’m going to go. Anyway, this year, a gentleman comes up and asks me if he can ask me a few questions. I figure maybe he is looking to get into cartooning, or has a comic and wants to know how to get it into the paper or something. Whatever the case, I am happy to talk with anybody, and if you are an aspiring artist and you think I have insight that may help, I am happy to share it with you. So he starts by letting me know that he is William Ketchum, a reporter for the Flint Journal. Ok, I already enjoy speaking with people about ArDuffle, but a reporter?! This just got cooler. 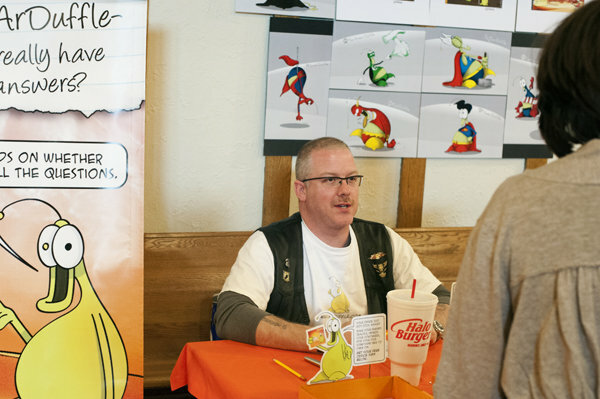 Well, it turns out he is there covering the Comix Con for the Sunday edition of the Flint Journal and MLive (the online version) and I made it in the article. Please make sure to leave a comment, because just like with comics, reporters like hearing from their readers too. Being a labor of love, I receive no compensation for the time, efforts and money I put into ArDuffle. I do it for the love of it, and for you, my readers. So I have decided to open a store where I can offer signed copies of my book (with bookmark), original pencil art of the positions used in the different ArDuffle features, original sketch cards, signed high quality prints of various strips and other print quality material and whatever ArDuffley goodness I can come up with. This store will help me defer some of the costs of doing a webcomic and help me to continue bringing you the ArDuffle features you enjoy with the regularity you have come to expect. You don’t have to buy anything, but it would help. Besides, these kinds of deals aren’t going to come along every day. I mean, original pencil art of the ArDuffle features themselves? Who else has that? Get your swank ArDuffle collectibles today. Some are even one of a kind, like ArDuffle. As many of you may know from his bio (which you can read here), ArDuffle does not only give out excellent advice (if he does say so himself), but during the day he is also a stunt double for an intergalactic action hero. A job he finds very rewarding, although he may not be all that good at it. Below you can find some great shots of him in action. Enjoy.